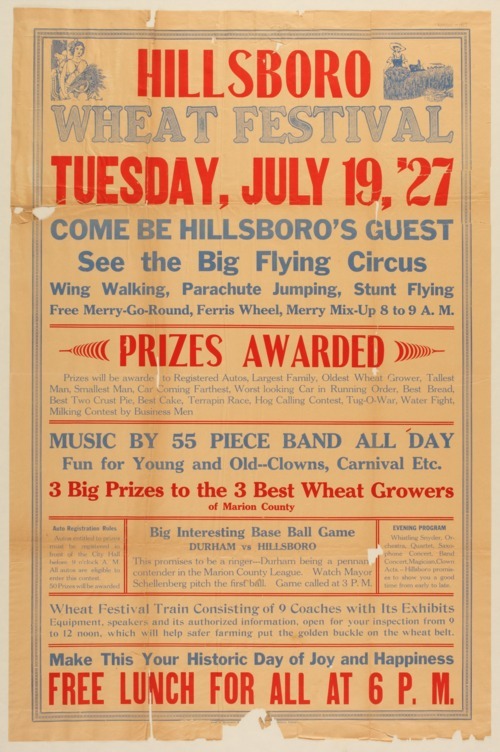 This poster describes the events that are part of the Hillsboro Wheat Festival on July 19, 1927. Prizes will be awarded for various reasons including the three best wheat growers in Marion County. The main attraction is a "Big Flying Circus" with wing walking, parachute jumping and stunt flying. Other activities include a baseball game between Durham and Hillsboro, music by a 55 piece band, clowns, a carnival, and a wheat festival train with 9 cars and speakers.